Despite being a highly celebrated artist, there are very rare opportunities of seeing his works displayed in Italy. As there is no current anthology about his life and works, this virtual art gallery represents “an extraordinary opportunity” to see the artist’s interesting visual poetry, as well as his style and favourite subjects. "Danilo Picchiotti lives as he paints: moving away from external constraints, constantly searching for new ways to express his undefined and unaccomplished consciousness, endlessly seeking new empty spaces to dive in and finding unique expressions of true artistic freedom. His way of painting is passionate and impulsive: his works show the traces of sudden shifts, made out of instinct and without premeditation. He is possessed by a passion of instant creative freedom and by an artistic act originating from inside that bursts out abruptly before any meditation. By choosing to paint abstract art he expresses his desire to transcend limits, to overcome imposed rules and to go beyond dimensions and "always be nowhere and everywhere at the same time, and explore the core of things and all living beings". For his need of freedom Danilo Picchiotti cannot be classified into known groups or painting schools. 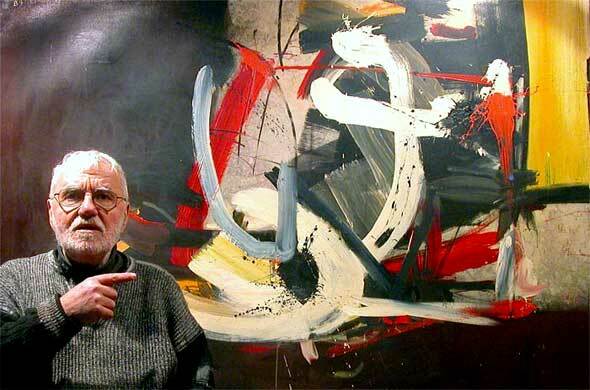 Though he deeply knows and studies abstract art, he lives his creative experience alone". in the works of Danilo Picchiotti. “During Picchiotti’s artistic career, Informal Art, in all its poetic forms, is one of the most dominant artistic movements in the Western art scene. Among the fundamental topics of this vast cultural attitude there is the rejection of any kind of connection to the legacy of tradition and history. In 1952, the “militant” critic Michel Tapié claimed that the purpose of the “Art of Informel” was to develop an “art autre” or “art of another kind”, so that art is completely freed from its past. In Picchiotti’s painting there is an eagerness to reconstruct, which is grounded on the need for new ethics, able to make up for the empty ideals of the late 19th century, that eventually led to a general sense of rejection and radical break with the past caused by the World Wars. A variant of Informal Art often referred to as Matter Painting is the predominate art trend in Europe. It derives from an ancient dichotomy first developed by Plato and then by other later philosophers: the Matter/Form polarity. The former indicates the shapeless magma of raw, primitive energy, while the latter represents the matter structured into superior organisms. This Matter-Form contrast became the main issue in Michelangelo’s sculptures and it will later influence modern sculpture through the “rediscovery” of Rodin. Thanks to Informal Art even painters begin tackling the issue by presenting images, where aesthetic and expressive values are expressed by the materials they use. Matter Painting starts in the same year Pollock invented Action Painting: 1943. The leading figure of this movement is the French painter Jean Furtrier, who is inspired by Picasso and Braque’s Synthetic Cubism and by Max Ernst’s surreal quests, and who incorporates his paintings with plastic materials emerging out of the canvas itself. In this way he overcomes the boundary between two-dimensional images and plastic forms, generating art works that can no longer be classified as conventional forms of painting or sculpture. European artists highlight the expressive values of the matter including, just to cite a few examples, the French Jean Dubuffet, the Spanish Antoni Tápies and the Italian Alberto Burri. The key issue in Abstractionism, and in all its different forms, is that it breaks away from the past and is basically an act of estrangement and alienation from the physical, changeable and phenomenal reality we live in. This, however, implies the willingness of the artists to relate to this reality, if only to reject it or distort its forms, according to a conscious research of a philosophical, and after all rational, explanation of the referential link between image and reality. Informal Art imposes itself in this historical-cultural climate, breaking away from the past and radically rejecting any cultural links with the conventional notion of order, which founds itself completely devastated by the WWII; it finally establishes itself as the triumph of the irrational and denies the intellectual and spiritual foundations of Abstract Painting.